This movie created a lot of well-deserved buzz in anticipation of its release. Upon the announcement of its release date, we gave some preliminary predictions concerning the anticipated analysis. An analysis did follow sometime later, and the film was quite a surprise; that analysis is available on this site now. Other articles of peripheral interest followed this one, including movie and actor news, looks ahead to future film and analysis releases, best of articles, and more. This section will be expanded; I have a number of "best of time travel movies" articles in the works, and will probably continue to pursue predictions of future analyses and similar pieces as I am able. Of course, this depends in significant part on your support through Patreon or otherwise (a number of the movies I have analyzed were copies gifted by readers). I thank you for that in advance. 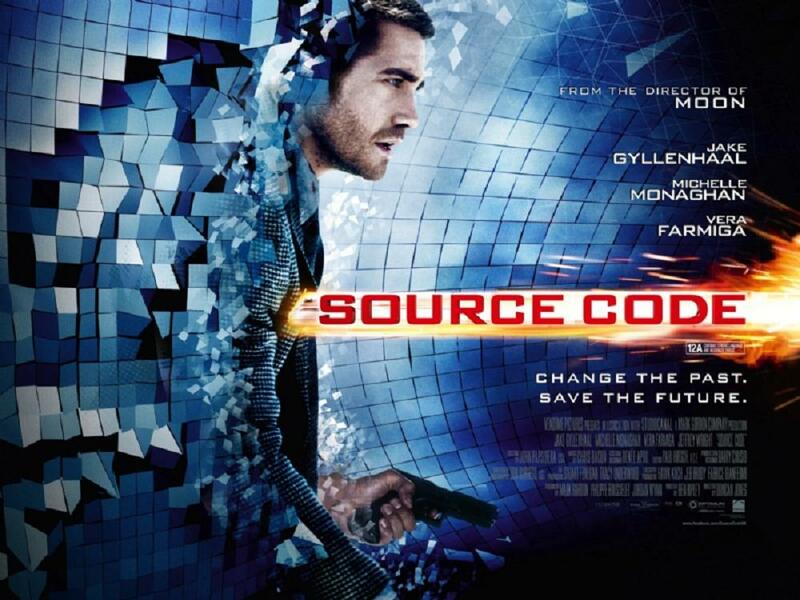 A new time travel action thriller, Source Code, opens in theatres April 1, 2011. The story utilizes a common trope, of a man reliving the same period of time repeatedly. The best known of such stories is undoubtedly Groundhog Day, and others include 12:01 and the short story The Perpetual Barbecue. This version, though, is distinguished by several features. The time period the hero relives is only eight minutes long, the last eight minutes before a bomb he is trying to locate and identify destroys the train on which he is riding. Also, after each iteration he returns to his future point of origin and chooses to travel back again in search of that critical information. In the fashion of Quantum Leap recently echoed in Hot Tub Time Machine, the traveler exists in the past by possessing another body, in this case the body of someone aboard that train. Early information suggests that the film is using some sort of parallel dimension theory. The hero is not attempting to prevent the bombing that already occurred, but to find the bomb and from that identify the bomber so as to prevent another attack which is expected in a matter of hours. However, he becomes focused on trying to save the life of one of the people on the train despite the insistence of his superiors that time does not work that way, that he will be unable to save her because this would change the past. Such reasoning echoes The Time Machine and perhaps Premonition, but is also rejected by Happy Accidents, The Lake House, Deja Vu, and Time Cop, all of which allow the hero to save the girl in the end. This site's Time Travel Films Examiner expects to do a fuller analysis of this film in the future.